This Half Term malarkey has me all discombobulated! I don't often know what day of the week it is already, and this week, I am right out! But. It's fab to have The Cheeks to myself. 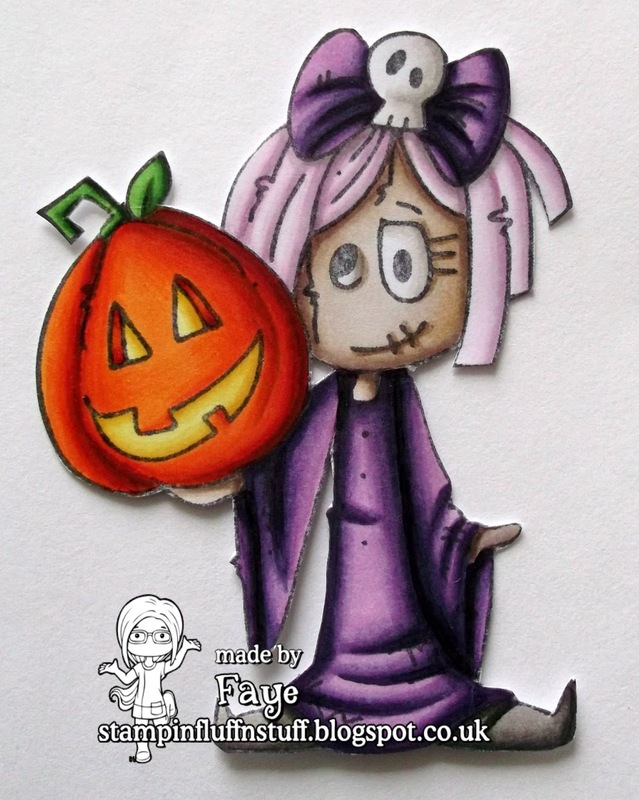 So, if today is in fact Thursday, it's time for some Little Miss Muffet Stamps Inspiration. Be sure to stop by the Facebook Group, as the Little Misses will be popping up throughout the day. oh my goodness cute cute cute Faye. Wow, wow, wow! This is spectacular! I love the word discombobulated as well! You are so very talented! Brilliant Faye! Amazing colouring as always too! 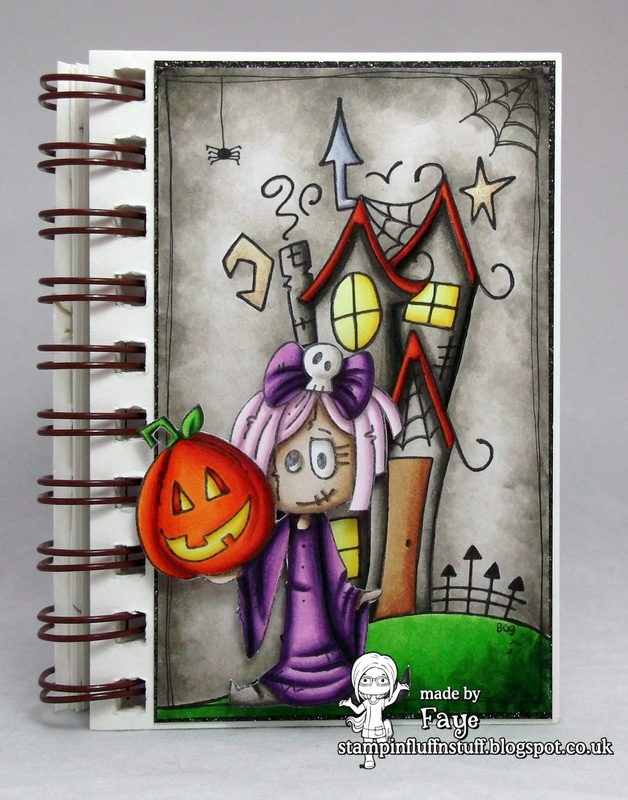 In fact I don't like Halloween cards, but you managed to change my opinion with this fab colored booklet....love it! We had discombobulated allsorts last week. It was Tom's word of the week at school! What a fab word! A brilliant spooky creation! Your colouring is amazing, as always - I especially love the foggy sky! What a cute kind of spooky! Great card Faye! Weird... I thought I'd been here and commented... hmm, that's it, mind officially left the building! I was going to suggest that you rename 'The Discombobulated Blog'... good idea? hehe! 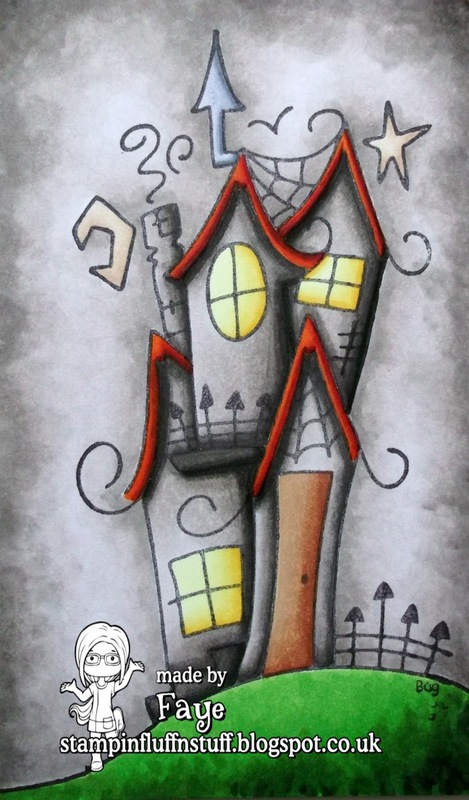 And now to the important bit... LOVING this fabbie spookaliscious image and your perfect colouring.... that shading around the house... just SO RIGHT! Great combination of images, a super, spooky scene with a fun doodled frame with spiders and cobweb! Ooh! this is sooooo gorgeous Faye, the images all look fab together. Wonderful colouring too hun. wow! This is amazing! Your image has so much depth to it, beautifully done!